Diners were enjoying a leisurely meal at a Waite Park restaurant in central Minnesota on Saturday when an ice jam caused the Sauk River to rise suddenly, flooding the building. More than 40 people had to be evacuated. It was a reminder of just how unpredictable and destructive ice jams can be during Minnesota's spring flooding season. What are ice jams, and can experts predict when and where they will form? We asked James Fallon, a hydrologist with the U.S. Geological Survey, who oversees stream monitoring in Minnesota. 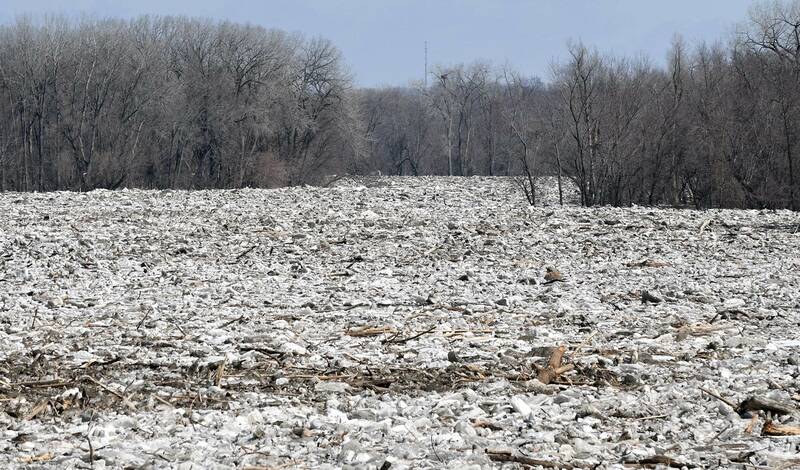 Ice jams typically form in the spring, as snow melts and the river's volume and flow increase. All that water lifts the ice on the river and puts stress on it, breaking it into chunks. Sometimes, those pieces just flow downstream, melting along the way without causing any problems. But, Fallon said, if the ice is really thick, the river might not able to break it all up and carry it away. When that happens, chunks of ice may get stuck and cause a jam that blocks the water's flow — especially in places where the river bends or gets narrower or shallower, Fallon said. They also sometimes form near man-made structures in the river, such as bridges or piers. "Once the ice starts to catch, then everything else starts to build up behind it until it gets enough pressure that it can just break that dam or jam, and send it all back downstream," Fallon said. Ice jams also can form on lakes, too, although those are a little different. They're often formed by wind blowing from one direction, moving the ice and piling it up on shore. Why are ice jams a problem? Ice jams can cause the stretch of the river behind them to suddenly back up because the water has nowhere to go. That can cause flooding in the surrounding area, and quickly — sometimes within an hour or two of the ice jam forming. It's unlike most spring flooding, which typically develops over days and weeks. Ice jams can also damage structures on the shore such as bridges, docks and buildings. Fallon said ice jams also make flood forecasters' jobs more difficult because they make the river or stream level to seem higher than it really is. Those levels are used to predict when rivers and streams could reach flood stages. There's also the practical problem of trying to monitor the river's water level and flow through all that ice, he said. "We have to wait for the river to clear to get in there and do that," he said. Is this a particularly bad year for ice jams? Fallon said this winter had almost perfect conditions for ice jams: very cold weather in January without a lot of snow, which helped create very thick ice on rivers and lakes. "The thicker the ice, the more material that river has to move," he said. Fallon said he's seen more ice jams in southern Minnesota in the last two weeks than any other year in his two decades of stream monitoring. Minnesota's slow, gradual spring warmup this year is helping to reduce the possibility of significant flooding. But Fallon said it's also kept the rivers' flow rate a little lower than if the melt had happened all at once, so they may not have the capacity to carry out all that ice away. Can experts predict when and where ice jams will form? It's very difficult to predict an ice jam because they can form quickly and sometimes at random, Fallon said. Some agencies, including the U.S. Army Corps of Engineers, gather data and try to map locations where ice jams typically form. Local residents are often familiar with those spots. But it's not an exact science, Fallon said. And knowing when an ice jam will form, how large it will be or how much water it will back up isn't really possible. Is there anything anyone can do about ice jams? Local government agencies tend to watch for problematic ice jams and, if possible, break them up before they cause too much damage. 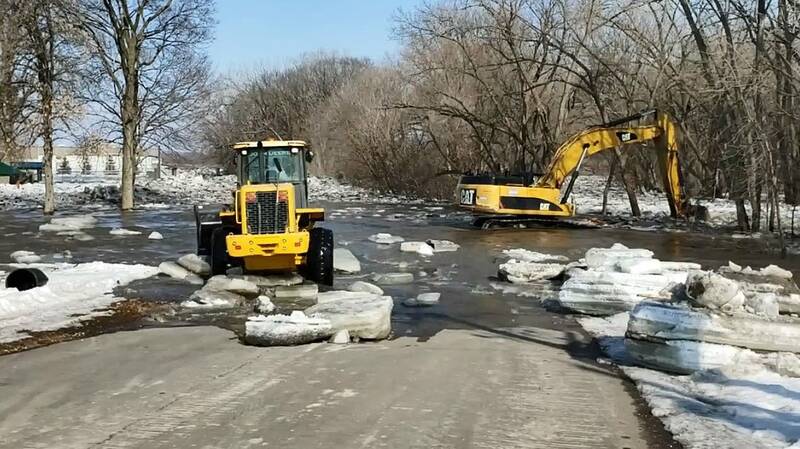 That happened last Friday in Delano in central Minnesota when city crews used an excavator to break up a huge ice jam caused the South Fork Crow River to rise to major flood stage. Fallon said he has a 1965 photograph of someone using a bow and arrow to shoot a stick of dynamite into an ice jam during spring floods, but he added, "I don't think they do that much anymore." Today, it's more typical for public works crews to use a backhoe or other machinery to break up the ice and get it moving downstream. Information from the National Oceanic and Atmospheric Administration and the National Weather Service contributed to this report.